Jewish cuisine is a diverse collection of cooking traditions of the Jewish people worldwide. It has evolved over many centuries, shaped by Jewish dietary laws (kashrut), Jewish Festival and Shabbat (Sabbath) traditions. Jewish cuisine is influenced by the economics, agriculture and culinary traditions of the many countries where Jewish communities have settled and varies widely throughout the whole world. The distinctive styles in Jewish cuisine are Ashkenazi, Sephardi, Mizrahi, Persian, Yemenite, Indian and Latin-American. There are also dishes from Jewish communities from Ethiopia to Central Asia. Since the establishment of the State of Israel in 1948 and particularly since the late 1970s, a nascent Israeli "fusion cuisine" has developed. Jewish Israeli cuisine has especially adapted a multitude of elements, overlapping techniques and ingredients from many diaspora Jewish culinary traditions. Using agricultural products from dishes of one Jewish culinary tradition in the elaboration of dishes of other Jewish culinary traditions, as well as incorporating and adapting various other Middle Eastern dishes from the local non-Jewish population of the Land of Israel (which had not already been introduced via the culinary traditions of Jews which arrived to Israel from the various other Arab countries), Israeli Jewish cuisine is both authentically Jewish (and most often kosher) and distinctively local "Israeli", yet thoroughly hybridised from its multicultural diasporas Jewish origins. Certain foods, notably pork and shellfish, are forbidden; meat and dairy may not be combined and meat must be ritually slaughtered and salted to remove all traces of blood. Observant Jews will eat only meat or poultry that is certified kosher. The meat must have been slaughtered by a shochet (ritual slaughterer) in accordance with Jewish law and is entirely drained of blood. Before it is cooked, it is soaked in water for half an hour, then placed on a perforated board, sprinkled with coarse salt (which draws out the blood) and left to sit for one hour. At the end of this time, the salt is washed off and the meat is ready for cooking. Today, kosher meats purchased from a butcher or supermarket are usually already koshered as described above and no additional soaking or salting is required. According to kashrut, meat and poultry may not be combined with dairy products, nor may they touch plates or utensils that have been touched by dairy products. Therefore, Jews who strictly observe kashrut divide their kitchens into different sections for meat and for dairy, with separate ovens, plates and utensils (or as much as is reasonable, given financial and space constraints; there are procedures to kasher utensils that have touched dairy to allow their use for meat). As a result, butter, milk and cream are not used in preparing dishes made with meat or intended to be served together with meat. Oil, pareve margarine, rendered chicken fat (often called schmaltz in the Ashkenazi tradition), or non-dairy cream substitutes are used instead. Despite religious prohibitions, some foods not generally considered kosher have made their way into traditional Jewish cuisine; sturgeon, which was consumed by European Jews at least as far back as the 19th century, is one example. The hearty cuisine of Ashkenazi Jews was based on centuries of living in the cold climate of Central and Eastern Europe, whereas the lighter, "sunnier" cuisine of Sephardi Jews was affected by life in the Mediterranean region. Each Jewish community has its traditional dishes, often revolving around specialties from their home country. In Spain and Portugal, olives are a common ingredient and many foods are fried in oil. The idea of frying fish in the stereotypically British fish and chips, for example, was introduced to Britain by Sephardic Jewish immigrants. In Germany, stews were popular. The Jews of Netherlands specialized in pickles, herring, butter cakes and bolas (jamrolls). In Poland, Jews made various kinds of stuffed and stewed fish along with matza ball soup or lokshen noodles. In North Africa, Jews eat couscous and tagine. Thus, a traditional Shabbat meal for Ashkenazi Jews might include stuffed vine leaves, roast beef, pot roast, or chicken, carrots tzimmes and potatoes. A traditional Shabbat meal for Sephardi Jews would focus more on salads, couscous and other Middle Eastern specialties. The daily diet of the ordinary ancient Israelite was mainly one of bread, cooked grains and legumes. Bread was eaten with every meal. Vegetables played a smaller, but significant role in the diet. The Israelites drank goat and sheep’s milk when it was available in the spring and summer and ate butter and cheese. Figs and grapes were the fruits most commonly eaten, while dates, pomegranates and other fruits and nuts were eaten more occasionally. Wine was the most popular beverage and sometimes other fermented beverages were produced. Olives were used primarily for their oil. Meat, usually goat and mutton, was eaten rarely and reserved for special occasions, such as celebrations, festival meals, or sacrificial feasts. Game, birds, eggs and fish were also eaten, depending on availability. Figs, one of the most frequently mentioned fruits in the Bible. Most food was eaten fresh and in season. Fruits and vegetables had to be eaten as they ripened and before they spoiled. People had to contend with periodic episodes of hunger and famine. Producing enough food required hard and well-timed labor and the climatic conditions resulted in unpredictable harvests and the need to store as much food as possible. Thus, grapes were made into raisins and wine, olives were made into oil, figs, beans and lentils were dried and grains were stored for use throughout the year. The cuisine maintained many consistent traits based on the main products available from the early Israelite period until the Roman period, even though new foods became available during this extended time. For example, rice was introduced during the Persian era. During the Hellenistic period, as trade with the Nabateans increased, more spices became available, at least for those who could afford them and more Mediterranean fish were imported into the cities. During the Roman period, sugar cane was introduced. The symbolic food of the ancient Israelites continued to be important among Jews after the destruction of the Second Temple in 70 CE and the beginning of the Jewish Diaspora. Bread, wine and olive oil were seen as direct links to the three main crops of ancient Israel – wheat, grapes and olives. In the Bible, this trio is described as representing the divine response to human needs (Hosea 2:23-24) and, particularly, the need for the seasonal rains vital for the successful cultivation of these three crops. (Deuteronomy 11:13-14). The significance of wine, bread and oil is indicated by their incorporation into Jewish religious ritual, with the blessings over wine and bread for Shabbat and holiday meals and at religious ceremonies such as weddings and the lighting of Shabbat and festival lights with olive oil. Bread was a staple food and as in the Bible, the meal is designated by the simple term "to eat bread," so the rabbinical law ordains that the blessing pronounced upon bread covers everything else except wine and dessert. Bread was made not only from wheat, but also from barley, rice, millet, lentils, etc. Many kinds of fruit were eaten. There was a custom to eat apples during Shavuot, while specific fruit and herbs were eaten on holidays and special occasions such as, Rosh Hashana. Children received nuts and roasted ears of grain especially on the evening of Passover. Olives were so common that they were used as a measure (zayit). Meat was eaten only on special occasions, on Shabbat and at feasts. The pious kept fine cattle for Shabbat (Beẓah 16a); but various other kinds of dishes, relishes and spices were also on the table. Deer, also, furnished meat, as did pheasant, chickens and pigeons. Fish was eaten on Friday evening in honor of Shabbat. Fermented fish sauce was an important article of commerce, being called "garum" among the Jews, as among the Greeks and Romans. Pliny says expressly of a "garum castimoniale" (i.e., kosher garum) that it was prepared according to Jewish law. A specific type of locusts were eaten. Eggs were so commonly eaten that the quantity of an egg was used as a measure. While pork was prohibited by Jewish laws as described under the Kashrut laws, the refusal to eat pork only became central to Jewish identity while under Roman rule. Pork consumption during the Roman period increased and became closely affiliated with Romans not only as a common cuisine but also as a frequently sacrificed animal. Jordan Rosenblum has argued that by not consuming pork, Jews maintained their sense of particularity and even held a silent revolt against the Roman Empire. The first dish was a pickled starter to stimulate the appetite, followed by the main meal, which ended with a dessert, called in Greek θάργημα. 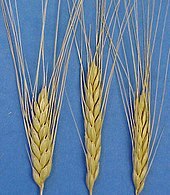 Afiḳomen is used in the same sense. Titbits (parperet) were eaten before and after the meal (Ber. vi. 6). Wine was flavored with myrrh or with honey and pepper, the mixture being called conditum. There was vinegar wine, wine from Amanus and Cilicia, red wine from Saron, Ethiopian wine, and black wine. Certain wines were considered good for the stomach, others not. There was beer from Egypt called zythos (Pes. iii. 1) and beer made from a thorn Spina regia. Emphasis was placed on drinking with the meal as eating without drinking (any liquid) causes stomach trouble. The Jews were so widely scattered in the Middle Ages that it is difficult to give a connected account of their mode of living as regards food. In Arabic countries the author of the Halakhot Gedolot knew some dishes that appear to have been specific Jewish foods, e.g., "paspag", which was, perhaps, biscuit; according to the Siddur Amram, the well-known "ḥaroset" is made in those countries from a mixture of herbs, flour and honey (Arabic,"ḥalikah"). Maimonides, in his "Sefer Refu'ot", mentions dishes that are good for health. He recommends bread baked from wheat that is not too new, nor too old, nor too fine, further, the meat of the kid, sheep and chicken and the yolks of eggs. Goats' and cows' milk is good, nor are cheese and butter harmful. Honey is good for old people; fish with solid white flesh meat is wholesome; so also are wine and dried fruits. Fresh fruits, however, are unwholesome; and he does not recommend garlic or onions. There is detailed information about Italian Jewish cookery in the book Massechet Purim. It discusses pies, chestnuts, turtledoves, pancakes, small tarts, gingerbread, ragouts, venison, roast goose, chicken, stuffed pigeons, ducks, pheasants, partridges, quails, macaroons and salad. These were considered luxuries. The oppressed medieval Jews enjoyed large meals only on Shabbat, festivals, circumcisions and weddings. For example, the Jews of Rhodes, according to a letter of Ovadiah Bartinura, 1488, lived on herbs and vegetables only, never tasting meat or wine. In Egypt, however, meat, fish and cheese were obtainable, in Gaza, grapes, fruit and wine. Cold dishes are still relished in the East. Generally, only one dish was eaten, with fresh bread daily. Some Jewish dishes frequently mentioned in Yiddish literature from the twelfth century onward are brätzel, lokshen, pasteten, fladen, beleg. Barscht or borshtsh soup is a Ukrainian beet soup, best known are the berkes or barches (challah) eaten on Shabbat, and shalet (cholent), which Heine commemorates, and which the Spanish Jews called ani (hamin). 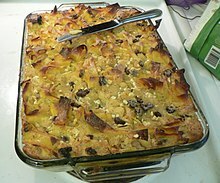 Shabbat pudding, kigl or kugel in Yiddish, is also well known. Most of the dishes cooked by Jewish of Eastern Europe origin are akin to those of the nations among whom they dwelled and in much of Europe (including most of the English-speaking world) is the dominant style associated with "Jewish cooking"; substitutions were made to accommodate the dietary laws. Hence, dishes which Gentiles make with pork are made with veal or chicken; chicken fat (or, more modernly, hydrogenated vegetable oil such as Crisco) is used in place of lard. Thus the kasha and blintzes of the Russian Jews, the mamaliga of the Romanians, the paprika of the Hungarians, are dishes adopted by the Jews from their gentile neighbors. Only on religious and ceremonial occasions did they cook special Jewish dishes. In the United States, in particular, Jewish cooking (and the cookbooks that recorded and guided it) evolved in ways that illuminate changes in the role of Jewish women and the Jewish home. Jewish cuisine has also played a bit part in shaping the restaurant scene in the West, in particular in the UK and US. Israeli cuisine in particular has become a leading food trend in the UK, with many Israeli restaurants now opening up sister restaurants in London and beyond. Jewish cuisines vary widely depending on their regions of origin, but they tend to be broadly categorized into Sephardi (Iberian and North African), Mizrahi (Middle Eastern and Central Asian) and Ashkenazi (Eastern and Central European) families. Still, there is significant overlap, between the different cuisines, as Jews have often migrated great distances and as different regions where Jews have settled (e.g. Southeastern Europe) have been influenced by different cultures over time. For example, Balkan Jewish cuisine contains both Ashkenazi / European and Sephardic-Turkish influences, as this part of Europe (up to the borders of present-day Austria and Poland) was for a time part of the Ottoman Empire. Since the rise of Ashkenazi Jewish migration to 19th-Century Palestine and the establishment of the State of Israel, increased contact between Ashkenazi, Sephardi and Mizrahi Jews has led to a rising importance of Middle Eastern and Mediterranean cuisine amongst Jews of all ethnicities. While Ashkenazi cuisine as it is known today is largely based within the context of American-Jewish and Ashkenazi-Israeli food, much of the culinary tradition of Ashkenazi Jews springs from Central and Eastern Europe. After having been expelled from Western Europe in the Middle Ages, Jews were forced to live in poverty and thus were limited in terms of ingredients. Dishes were made with fewer components; they weren't heavily spiced and ingredients that were more flavorful had to be used sparingly. This is often why some dishes in Ashkenazic cuisine are known for being blander than dishes in Sephardic or Mizrahi cuisine. With kosher meat not always available, fish became an important staple of the Jewish diet. In Eastern Europe it was sometimes especially reserved for Shabbat. As fish is not considered meat in the same way that beef or poultry are, it can also be eaten with dairy products (although some Sephardim do not mix fish and dairy). Even though fish is parve, when they are served at the same meal, Orthodox Jews will eat them during separate courses and wash (or replace) the dishes in between. Gefilte fish and lox are popular in Ashkenazi cuisine. While traditionally made with carp or whitefish and sometimes pike, gefilte fish may also be made from any large fish: cod, haddock, or hake in the United Kingdom. The combination of smoked salmon, or whitefish with bagels and cream cheese is a traditional breakfast or brunch in American Jewish cuisine, made famous at New York City delicatessens. Vorschmack or gehakte hering (chopped herring), a popular appetizer on Shabbat, is made by chopping skinned, boned herrings with hard-boiled eggs, sometimes onions, apples, sugar or pepper and a dash of vinegar. A number of soups are characteristically Ashkenazi, one of the most common of which is chicken soup traditionally served on Shabbat, holidays and special occasions. The soup may be served with noodles (lokshen in Yiddish). It is often served with Shkedei marak (lit. "soup almonds" – croutons popular in Israel), called "mandlen" or "mandlach" in Yiddish. Other popular ingredients are kreplach (dumplings) and matza balls (kneidlach) – a mixture of matza meal, eggs, water pepper or salt. Some reserve kneidlach for Passover and kreplach for other special occasions. In the preparation of a number of soups, neither meat nor fat is used. Such soups formed the food of the poor classes. An expression among Jews of Eastern Europe, soup mit nisht (soup with nothing), owes its origin to soups of this kind. Soups such as borsht were considered a staple in Ukraine. Soups like krupnik were made of barley, potatoes and fat. This was the staple food of the poor students of the yeshivot; in richer families, meat was added to this soup. There are a number of sour soups in the borscht category. One is kraut or cabbage borscht, made by cooking together cabbage, meat, bones, onions, raisins, sour salt (citric acid), sugar and sometimes tomatoes. Beet borsht is served hot or cold. In the cold version, a beaten egg yolk may be added before serving and each bowl topped with a dollop of sour cream. This last process is called farweissen (to make white). The dough of challah (called barkhes in Western Yiddish) is often shaped into forms having symbolical meanings; thus on Rosh Hashanah rings and coins are imitated, indicating "May the new year be as round and complete as these"; for Hosha'na Rabbah, bread is baked in the form of a key, meaning "May the door of heaven open to admit our prayers." 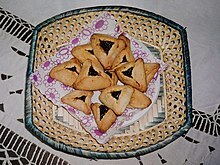 The hamentash, a triangular cookie or turnover filled with fruit preserves (lekvar) or honey and black poppy seed paste, is eaten on the Feast of Purim. It is said to be shaped like the hat of Haman the tyrant. The mohn kihel is a circular or rectangular wafer sprinkled with poppy seed. Pirushkes, or turnovers, are little cakes fried in honey or dipped in molasses after they are baked. Strudel is served for dessert. Kugels are prepared from rice, noodles or mashed potatoes. In Eastern Europe, the Jews baked black ("proster," or "ordinary") bread, white bread and challah. The most common form is the twist ("koilitch" or "kidke" from the Romanian word "încolăci" which means "to twist"). The koilitch is oval in form and about one and a half feet in length. On special occasions, such as weddings, the koilitch is increased to a length of about two and a half feet. The bagel, which originated from the Eastern Europe bublik, is a popular Ashkenazi food. Gebratenes (roasted meat), chopped meat and Essig-Fleisch (vinegar meat) are favorite meat recipes. The Essig or, as it is sometimes called, Honig or Sauerbraten, is made by adding to meat which has been partially roasted with some sugar, bay-leaves, pepper, raisins, salt and a little vinegar. Knish is a snack food consisting of a meat or potato filling covered with dough that is either baked or grilled. A popular dish among Ashkenazim, as amongst most Eastern-Europeans, is pierogi (which are related to but distinct from kreplach), often filled with minced beef. Kishka is a popular Ashkenazi dish traditionally made of stuffing of flour or matza meal, schmaltz and spices. The rendered fat of chickens, known as schmaltz, is sometimes kept in readiness for cooking use when needed. Geribenes or "scraps," also called griven, the cracklings left from the rendering process were one of the favorite foods in Eastern Europe. Schmaltz is eaten spread on bread. Holishkes, stuffed cabbage, also known as the cabbage roll, is also a European Jewish dish that emerged from more impoverished times for Jews. Because having a live cow was more valuable than to eat meat in the Middle Ages, Jews used fillers such as breadcrumbs and vegetables to mix with ground beef. This gave the effect of more meat being stuffed into the cabbage leaves. Flodni, a layered sweet pastry consisting of apples, walnuts, currants and poppy seeds, were a staple of Hungarian Jewish bakeries prior to World War II. Tzimmes consists generally of cooked vegetables or fruits, sometimes with meat added. The most popular vegetable is the carrot (mehren tzimes), which is sliced. Turnips were also used for tzimmes, particularly in Lithuania. In southern Russia, Galicia and Romania tzimmes was made of pears, apples, figs, prunes or plums (floymn tzimes). Kreplach, similar to Russian pelmeni are ravioli-like dumplings made from flour and eggs mixed into a dough, rolled into sheets, cut into squares and then filled with finely chopped, seasoned meat or cheese. They are most often served in soup, but may be fried. Kreplech are eaten on various holidays, among them Purim and Hosha'na Rabbah. The exact distinction between traditional Sephardic and Mizrahi cuisines can be difficult to make, due to the intermingling of the Sephardi diaspora and the Mizrahi Jews who they came in contact with. As a general rule, however, both types reflect the food of the local non-Jewish population that each group lived amongst. The need to preserve kashrut does lead to a few significant changes (most notably, the use of olive oil instead of animal fat is often considered to be a legacy of Jewish residency in an area, due to the fact that olive oil may be eaten with milk, unlike animal fat). Despite this, Sephardic and Ashkenazic concepts of kosher differ; perhaps the most notable difference being that rice, a major staple of the Sephardic diet, is considered kosher for Passover among Sephardim but it is forbidden as kitniyot by most Ashkenazim. Sephardic cuisine in particular is known for its considerable use of vegetables unavailable to the Ashkenazim of Europe, including spinach, artichokes, pine nuts and (in more modern times) squash. The cooking style is largely Middle Eastern, with significant admixtures of Spanish, Italian and North African flavors. The most popular Sephardic and Mizrahi dishes include malawach, jachnun, sabich, mofletta, meorav yerushalmi skhug and amba. As observant Jews do not cook on Shabbat, various techniques were developed to provide for a hot meal on Shabbat day. 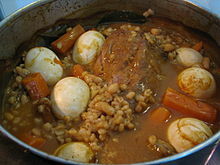 One such dish is "cholent" or "chamin," a slow-cooked stew of meat, potatoes, beans and barley (although there are many other variations). The ingredients are placed in a pot and put up to boil before lighting the candles on Friday evening. Then the pot is placed on a hotplate, traditional "blech" (thin tin sheet used to cover the flames and on which the pot is placed), or in a slow oven and left to simmer until the following day. A prominent feature of Shabbat cookery is the preparation of twists of bread, known as "challot" or (in southern Germany, Austria and Hungary) "barches." They are often covered with seeds to represent manna, which fell in a double portion on the sixth day. Another Shabbat dish is calf's foot jelly, called p'tsha or šaltiena in Lithuania and galarita, galer, galleh, or fisnoge in Poland. Beef or calf bones are put up to boil with water, seasonings, garlic and onions for a long time. It is then allowed to cool. The broth then jells into a semi-solid mass, which is served in cubes. Drelies, a similar dish originating in south Russia and Galicia is mixed with soft-boiled eggs and vinegar when removed from the oven and served hot. In Romania it is called piftie, in Serbia pihtije; it is served cold, with garlic, hard boiled eggs and vinegar sauce or mustard creme and considered a traditional dish in the winter season. On Rosh Hashanah, the Jewish New Year, several symbolic foods called simanim are prepared and eaten for a variety of different reasons, each unique to the dish. All of the ingredients within the dishes are kosher, which means they follow the laws of kashrut, the Hebrew word for correct. The majority of the dishes are sweetened to represent a prayer for a sweet (pleasant) new year. Such sweet dishes include apples that are either baked or covered in honey, Lekach (Honey Cake) and Makroudh (a pastry that is filled with dates and covered with honey). Dates, symbolizing the end, can also be eaten by themselves to encourage the enemies to meet their end. The value of the date can be traced back to biblical times, when the palm date is mentioned multiple times within the Bible itself, but also with how valuable dates were as an export. Challah bread is baked into a round, circular shape that is meant to represent the cyclical nature of life and the crown. It is also sweetened with either honey or a combination of cinnamon and sugar instead of being dipped into the usual kosher salt. Tzimmes, a side dish composed traditionally of sweetened carrots or yams, are served to symbolize prosperity, because of the double meaning of Yiddish word meren, which represents "to multiply" and "carrot". Head of a fish or a mutton, for a successful year in which we are the "head," not the "tail." Leek fried cutlets, called "Karteh" (for Sephardic Jews). Chard fried cutlets, called "Salkeh" (for Sephardic Jews). Local type of zucchini called qara'a, made into sweet confiture (for Sephardic Jews). Algerian Jews serve a honey-dipped date pastry called makroudh. It is customary to eat foods fried in oil to celebrate Hanukkah. Eating dairy products was a custom in medieval times. Fried doughnuts with grounded sugar sprinkled on top- called "Sfinge" (mainly by north-African Jews) or "Zalabiyeh". Passover celebrates The Exodus from Egypt where it is said the Jewish people left so quickly, there was no time for their bread to rise. Commemorating this event, Jews eat matza and abstain from bread, cakes and other foods made with yeast and leavening agents. In modern times, rabbinical authorities permit the use of chemical leavening, such as baking powder. Matza is a staple food during the holiday and used as an ingredient of many Passover dishes. Kneidlach (matza ball) soup is traditional. Fish is coated with matza meal before frying and cakes and puddings are made with potato starch and matza meal. Jewish cooks use both matza meal and potato starch for pastries during Passover. Whisked whole eggs or egg whites are frequently used to make pastries without leavening agents, such as angel and sponge cakes (potato starch replacing cake flour) and coconut and almond macaroons. Passover foods vary distinctly between Sephardic and Ashkenazic communities. Ashkenazim exclude rice, while it is served by Sephardim. Matza is traditionally prepared from water and flour only, but there are other varieties, such as egg matza, which may also contain fruit juice. At the seder, it is customary in some communities, particularly among strictly Orthodox Jews, to use handmade shmura matza, which has undergone particularly strict kashrut supervision. The exclusion of leaven from the home has forced Jewish cooks to be creative, producing a wide variety of Passover dishes that use matza meal and potato as thickeners. Potato flour is largely used in cakes along with finely ground matza meal and nuts. Popular Ashkenazi dishes are matza brei (crumbled matza with grated onion, fried with scrambled egg), matza latkes (pancakes) and chremslach (also called crimsel or gresjelies; matza meal fritters). Wined matza kugels (pudding) have been introduced into modern Jewish cooking. For thickening soups and sauces at Passover fine matza meal or potato flour is used instead of flour: for frying fish or cutlets, a coating of matza meal and egg and for stuffing, potatoes instead of soaked bread. "Noodles" may be made by making pancakes with beaten eggs and matza meal which, when cooked, are rolled up and cut into strips. They may be dropped into soup before serving. Matza kleys (dumplings) are small balls made from suet mixed with chopped fried onions, chopped parsley, beaten egg and seasonings, dropped into soup and cooked. Wine is also an important part of Passover meals. Traditionally, a Passover seder is severed with four cups of wine or grape juice, to be consumed along with various parts of the seder. Kosher wine is typically consumed for Passover. ^ Lupovich, Howard (2010). "7". Jews and Judaism in World History. p. 258. ISBN 0-203-86197-3. ^ Vamosh, Miriam Feinberg (16 December 2007). Food at the time of the Bible : from Adam's apple to the last supper. Herzlia, Israel: Palphot, Ltd. p. 12–13. ISBN 9652801151. ^ Rosenblum, Jordan (2010). "Why Do You Refuse to Eat Pork? Jews, Food, And Identity in Roman Palestine". The Jewish Quarterly Review. 100, No. 1: 95–110. ^ Hancock, Alice (17 July 2017). "Jewish food: the most comforting trend of 2017". Retrieved 20 October 2017. ^ Cameron, Rebecca (3 October 2017). "The Best 5 Restaurants in Jerusalem". Retrieved 20 October 2017. ^ "Jewish penicillin definition". Medterms.Com. Medicine Net.Com, a WebMD Company. Archived from the original on 2012-08-01. Retrieved 2012-07-12. ^ "Overview of Jewish Dietary Laws & Regulations". www.jewishvirtuallibrary.org. Retrieved 2018-10-24. ^ ""Lekach"—Honey Cake". www.chabad.org. Retrieved 2018-10-05. ^ "Serve Up A Sweet New Year: 10 Symbolic Foods for Rosh Hashanah". The Spruce Eats. Retrieved 2018-10-05. ^ "Palm". www.jewishvirtuallibrary.org. Retrieved 2018-10-24. ^ Museum, The Jewish (2017-09-19). "Pomegranates for Rosh Hashanah". The Jewish Museum. Retrieved 2018-10-05. ^ "Pomegranate". www.jewishvirtuallibrary.org. Retrieved 2018-10-24. ^ Kuruvilla, Carol (2014-09-24). "The Spiritual Meaning Of The Food On Your Rosh Hashanah Table". Huffington Post. Retrieved 2018-10-05. ^ "Round (Spelt & Vegan) Cinnamon-Sugar Challah for Rosh Hashanah". www.chabad.org. Retrieved 2018-10-05. ^ "Traditional Rosh Hashanah Tzimmes". www.chabad.org. Retrieved 2018-10-05. Wikimedia Commons has media related to Jewish food. This page was last edited on 20 March 2019, at 04:12 (UTC).